Rush archivist Nathalie Wheaton will present “Lady Doctors: Women Physicians at Rush Medical College, 1900-1920,” on Thursday, Jan. 13, noon to 1 p.m. in Armour Academic Center, Room 539. 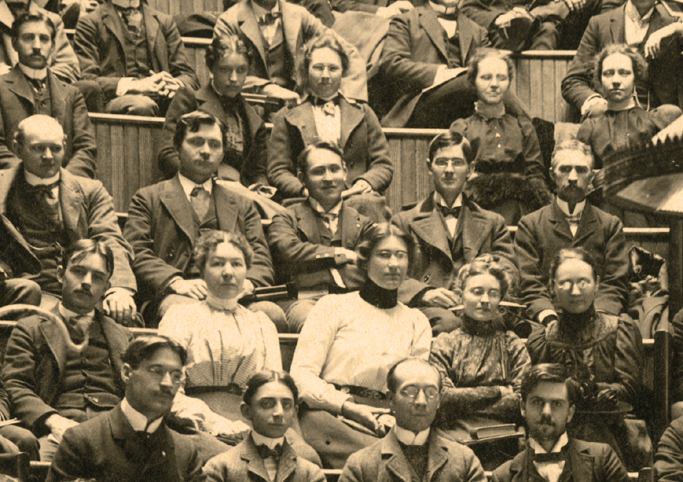 Rush Medical College students, including several women, attend a teaching clinic by James B. Herrick, MD, in 1899. As American women mobilized to obtain the right to vote at the beginning of the 20th century, many rebelled against the separate spheres ideal of femininity and sought equality with men in both the academic and professional arenas. The Progressive Era, from the 1890s to 1920s, introduced vast social reforms, including standardization of medical education. The Flexner Report of 1910 exposed the disparities in quality among medical schools throughout the country, and called for higher standards for admission and graduation requirements, and more practical student experience. Women navigated the changing waters as a small but consistent minority and paved the way for future generations of female physicians. Chicago, already world-renowned for its medical community, offered opportunities for women, but few prospered without facing struggles and outright discrimination. Effa V. Davis, MD, assistant clinical professor, Department of Obstetrics and Gynecology, Rush Medical College, 1898-1904, likely Rush’s first female faculty member. Ruth Tunnicliff, MD, Rush Medical College, class of 1903, research scientist specializing in bacteriology and immunology. Caroline Hedger, MD, Rush Medical College, class of 1904, health advocate for women and children. Isabella Coler Herb, MD, chief anesthetist of Rush Medical College and Presbyterian Hospital, 1909-1941, and the first anesthetist to use ethylene gas during an operation. “Lady Doctors” is one of several events coinciding with “Changing the Face of Medicine: Celebrating America’s Women Physicians,” a traveling exhibit from the National Library of Medicine currently being hosted by Rush. The exhibit, located on the fourth floor of the Atrium, continues through January. Nathalie Wheaton, MSLS, is assistant archivist for the Rush University Medical Center Archives. Interested in learning more about the history of Rush? Contact the Rush Archives at (312) 942-7214 or Rush_Archives@rush.edu or visit us at www.lib.rush.edu/archives. This entry was posted in Uncategorized, Women in Medicine. Bookmark the permalink.